On her long journey home from school after a fight that will surely lead to her expulsion, Karigan G'ladheon ponders her uncertain future. As she trudges through the immense Green Cloak forest, her thoughts are interrupted by the clattering of hooves, as a galloping horse bursts from the woods. Before he dies, he begs Karigan to deliver the "life and death" message he bears to King Zachary. When she reluctantly he agrees, he makes her swear on his sword to complete his mission, whispering with his dying breath, "Beware the shadow man...". 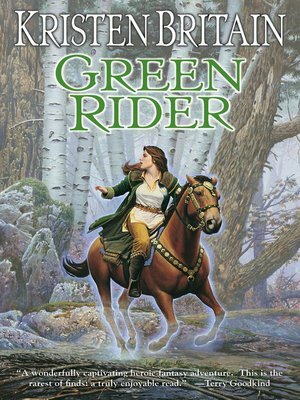 Taking on the golden-winged horse brooch that is the symbol of the Green Riders, Karigan is swept into a world of deadly danger and complex magic, her life forever changed. Compelled by forces she cannot understand, Karigan is accompanied by the silent specter of the fallen messenger and hounded by dark beings bent on seeing that the message, and its reluctant carrier, never reach their destination.